by Dr. Clarence V. Boyd, Jr. 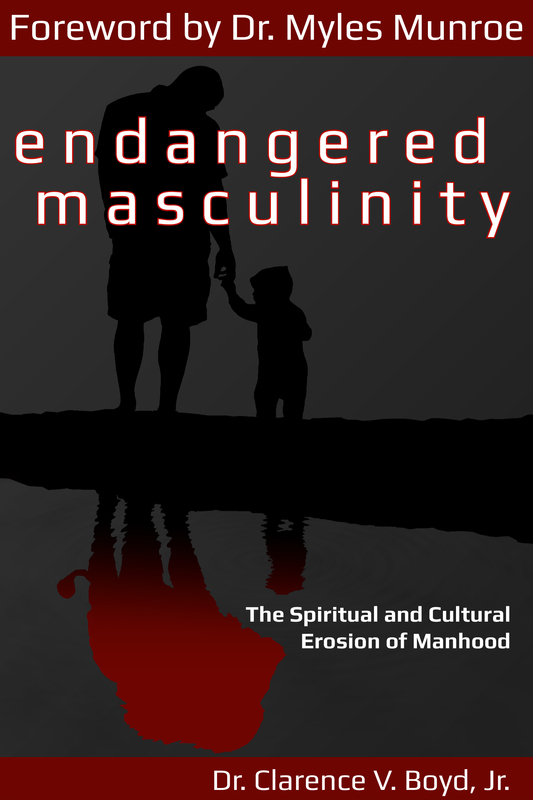 Endangered Masculinity draws attention to the need to restore to the male-man the original understanding of manhood, while exposing the hidden fact that when the man is out of place there will always be confusion. This is a spiritual reality which is validated by the fact that God created mankind to rule and the male-man to lead. Every man has been anointed with a king on the inside of him. The question is: Will man become the king or just remain a man? Dr. Boyd is speaking to the next generation of men about fatherhood, manhood, and masculinity. He is the President and Founder of Revelations-Revealed Truth Ministries, an evangelistic outreach which targets intercity youth who are considered at-risk. Dr. Boyd and his wife are the founders of Revelations-Revealed Truth Evangelistic Center, a local church in the city of Tulsa. Men live in a culture that has compromised their authority while undermining their identity. And like the men in Joshua’s day, men today have been lulled to sleep concerning their families and their homes. The point must be made that men today need to be challenged like the men in Joshua’s day. From the beginning to the present men have been missing. Men are missing in homes today. Men are missing out in the lives of their children. Men are missing in the church and sometimes the work-place as well. When it comes to our communities today, men are missing as a result of violence and crime. Although there are many more reasons why men are missing, the real question is: “Where are the men?” If men are missing, they still are somewhere. In reality, they are somewhere else because it is evident they are not where they are supposed to be. This is not a new challenge. The absence of men has been a reality throughout the generations. The greater challenge today is whether men can be found, and restored to their rightful place in the communities of life. The writer of Hebrews makes it clear that Jesus is the only person able to represent the Father in the earth. The point is made that Jesus has been appointed the heir of all things, but more importantly is the fact that everything was made through him. Then a revelation is shared for us to meditate on. The Son has the responsibility to sustain everything by the power of His word. In short, Jesus is the source of all creation. Because He is responsible for what He has created, He has the responsibility to sustain it. For any booking inquires or additional information, please CONTACT US. For any marketing inquires, please contact COALESCENT CREATIVE. © 2013 - 2018 C+K PUBLISHING, LLC. All Rights Reserved. Site Powered by COALESCENT CREATIVE.